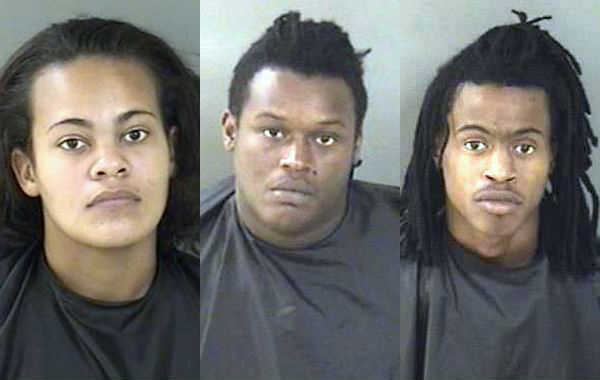 VERO BEACH – The Walmart store in Vero Beach called the Indian River County Sheriff’s Office about three suspects stealing 23 video games, a ham and cheese lunchable, and a package of Slim Jims. The three suspects, identified as 21-year-old Britani Rene Robinson, 18-year-old Samuel Mangual, and Treveon Mangual, are allegedly part of an Organized Retail Crime group (ORC) that have been seen at other Walmart stores. The suspects selected several video games from the shelf and placed them into a cart in the Vero Beach store. They were moved throughout the store gradually and concealing the selected video games into a diaper bag and purse. The suspects then selected several food items and went to a self-checkout register where they only paid for two items. As they exited the store, they were met by deputies. All three subjects stated that they were planning on selling the video games in an attempt to make money for Britani’s child. They told deputies that they were unemployed. They were arrested and transported to the Indian River County Jail where they were charged with Retail Theft.